Some might think it's too early to be thinking about spring accessories but it has been over 40º in Chicago so it's basically spring. Ok ok technically, spring officially begins on March 20th so I'm not too far off. While I wait for the temperatures to rise I am eagerly planning my spring and summer outfits. This might seem like a very strange thing to do but when you love summer as much as I do, planning is the only thing that keeps you going. Lucky for me, wild things are happening in fashion right now which is keeping me quite entertained. As usual, I am intrigued by the current and upcoming trends...some are very familiar and some are a bit questionable. Continue below for a sneak peek of what's to come! I hope this trend lasts forever because i've always loved kitten heels. I feel like kitten heels are often overlooked because they don't have the same leg LENGTHENING strength of taller heels. However, all that seems unimportant when your'e ACTUALLY able to walk properly and comfortably. Formerly known as the ''Fanny Pack", the belt bag is taking over. This is something I never thought would happen but yes bags around the waist are suddenly huge again. I wasn't sure if this trend would get very far but it most definitely has. I hate to admit it but I'm actually loving it. I might feel differently when I'm looking back at this 10 years from now but it's ease on our shoulders and it's nice being hands-free at times. I am still taken aback by this trend, I thought it was one of those trends that would stay with the beer fashionable crowd but it is definitely trickling down to the mainstream crowd. Who would ever think that one day you would see a pair of louboutin heels worn with a pair of white ankle socks...not i! Ihave a feeling this trend will evolve soon so if you have a pair of socks you would like to show off with a pair of heels..now is the time. As we all know there is nothing new about cat eye glasses but they've changed a bit. This season the glasses are a bit more slim and definitely sharper. I think the new silhouette is a bit harder to pull off but more power to the many women that are rocking this trend! This is a pretty risky trend because you're putting it all out there. It worries me because you DEFINITELY can't have ANYTHING too VALUABLE in your bag but it forces you to maintain a neat bag which we all need at times. 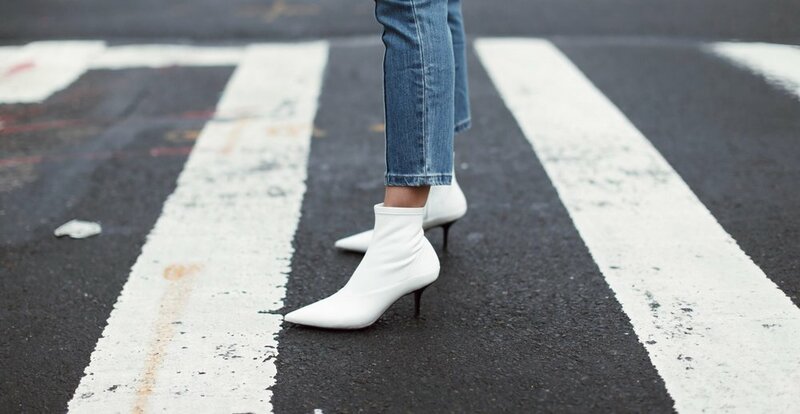 Similar to Cat Eye glasses the white boot trend also isn't new but liek the ankel sock trend it is reaching its peak in popularity. When this trend staed gaining popularity I was a bit skeptical but the more I see it the more it grows on me. White shoes add great contrast and interest to most outfits. My main issue with this trend is the thought of keeping these shoes clean. I have a pair of pink vans that i have tried very hard to keep clean and I have failed...I can't imagine how difficult it would be to keep shiny white boots spot free.